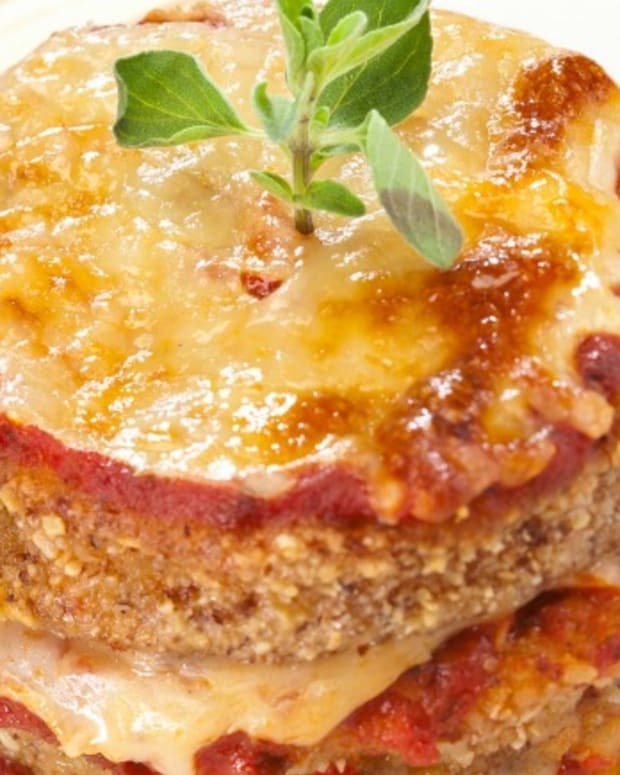 An updated version of an old family favorite - eggplant parmesan! 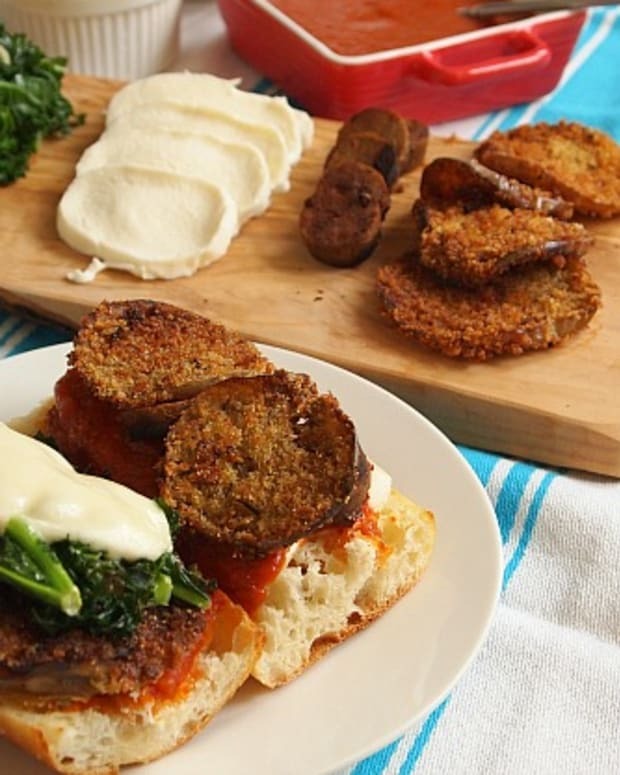 Place the eggplant slices on a wire or cooling rack over a cookie sheet. Heavily cover the eggplant slices, on both sides, with the kosher salt. Let the eggplant sit for one hour. Rinse off the salt and pat the eggplant thoroughly dry. 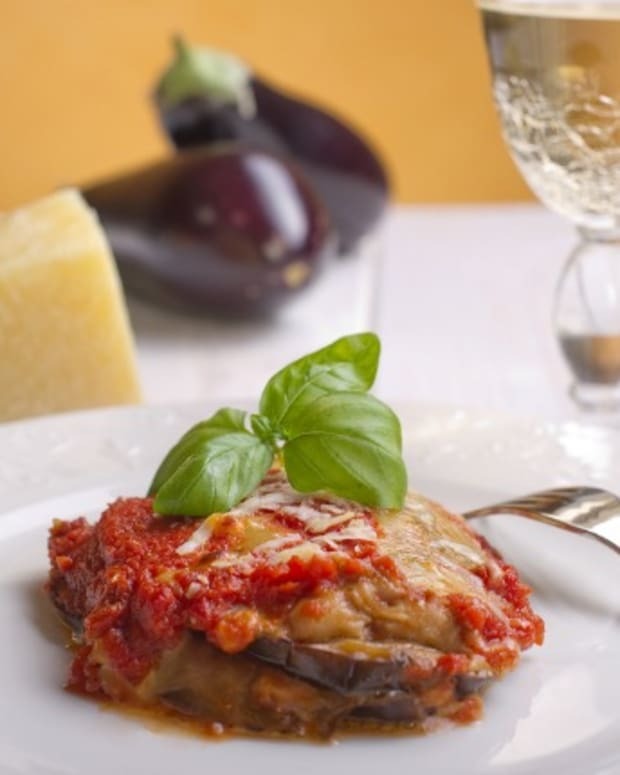 Put the flour in a pie pan or container that can accommodate the eggplant. Place the eggs in a separate container. 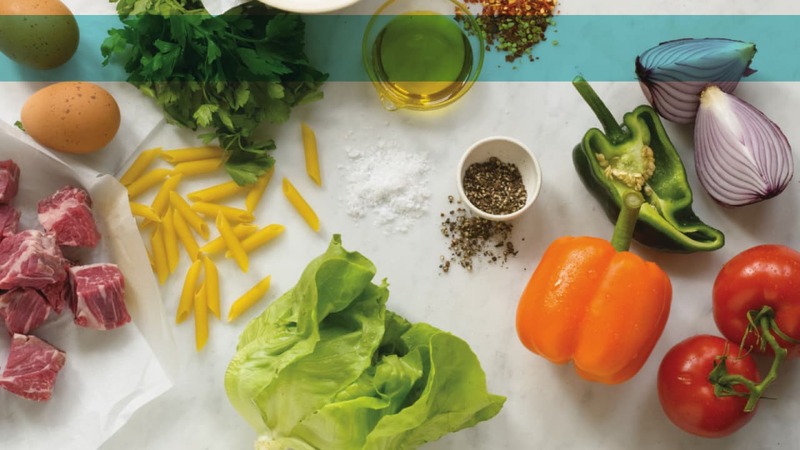 Mix the breadcrumbs and fresh herbs in a third container. Heat a large saute pan with about 1/2 inch of olive oil over medium-high heat. Place the eggplant in the flour and dredge to coat completely. Dip the eggplant in the eggs and finally in the breadcrumbs. Fry the eggplant in the hot oil until it is golden brown, flip and fry on the other side. Transfer the eggplant to a sheet pan lined with paper towels. Repeat the process until all the slices are browned. Transfer six eggplant slices to another sheet pan. Spoon three tablespoons of sauce on top of each slice. Top with one slice of mozzarella cheese and a basil leaf. Sprinkle with parmesan cheese. 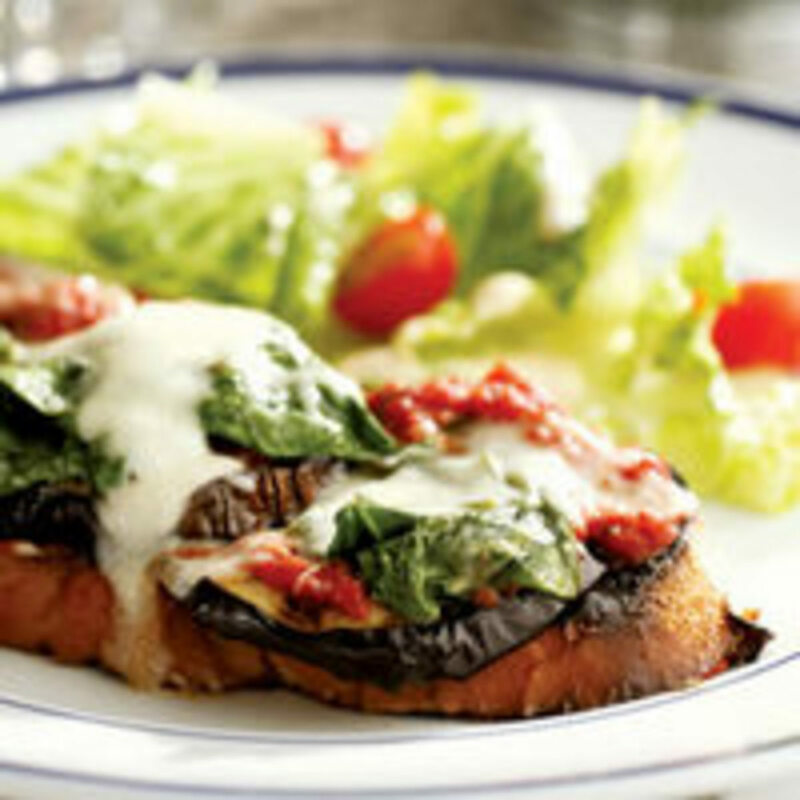 Place a second slice of eggplant on top of each stack. Spoon additional sauce, more cheese and basil on top. Confit tomatoes are easy to prepare and add depth of flavor to this dish. 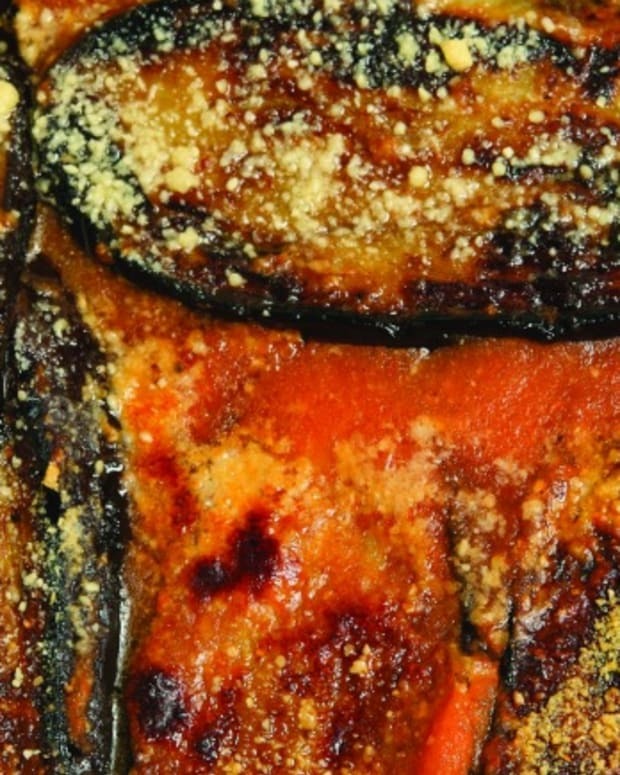 The practice of salting eggplant before cooking is not to remove bitter juices. Eggplants are made of mostly water held in small cells. 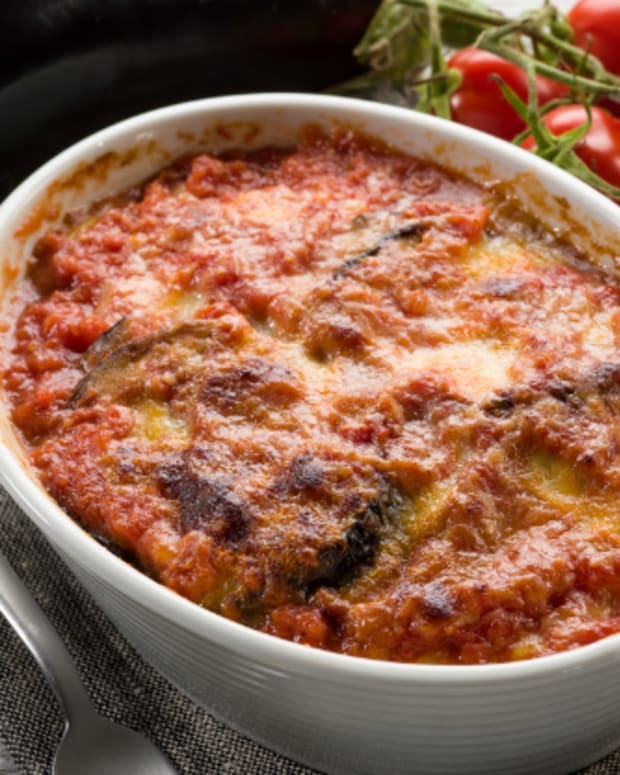 Not removing the water before frying would result in soggy, greasy eggplant. By purging the cells of the water we remove the water and collapse the cells so they do not absorb the oil during frying. This keeps the eggplant crispy and prevents it from being greasy.